Do you wish you had a little more storage space in your bedroom? Are you struggling to close them wardrobe doors? Do you use the top of your free standing wardrobe for storing unsightly boxes? How nice would it be just to close everything away behind doors leaving your room looking uncluttered? 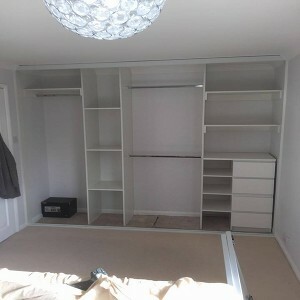 Let us help, We’ll design and fit wardrobes that look great, and create much more living and storage space. Give your bedroom the individual appearance you’ve always wanted, with a custom wardrobe from S&T Sliding Wardrobes. Nothing says luxury more than something that’s hand made to your specification. Need a tie rack? A skirt rail? A hat stand? We create custom wardrobe designs entirely tailored to you. If you’re unsure how to get the most out of your bedroom space, we can help. With a wealth of experience, we can provide a great value wardrobe design service that can transform the most important room of your house. Do you like traditional wood or modern glass? 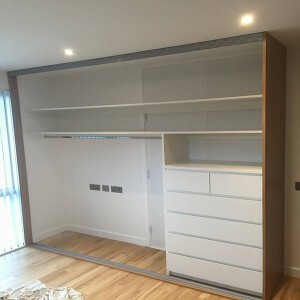 We have a wide range of wardrobe interiors and fronts to select from.